Male Sheargrubs (ウジンコ♂?, lit. : "Parrot Maggot ♂") can easily be distinguished from Female Sheargrubs by their dark purple color and large mandibles. Unlike the females, which are believed to scavenge dead Pikmin, Male Sheargrubs are predatory and extremely aggressive, and will attack leaders and Pikmin when the opportunity presents itself. Sheargrubs have lost both their legs and wings in an odd twist of evolution, and have adapted to a life spent mostly underground. In Pikmin, these bugs are completely invulnerable while they're chomping down on a Pikmin except when a Pikmin is tossed directly on top of it. This was fixed in Pikmin 2, allowing players to kill them even if they have a Pikmin in their grasp. Sheargrubs, both male and female, will also deconstruct any nearby stick bridges, which makes defeating these pesky creatures soon after landing a top priority to avoid having to rebuild them. These creatures are also related to the Shearwig, in that they share families. In Pikmin 3, they can regenerate health while buried, and are able to fully regenerate in 30 seconds, just like the Female Sheargrubs. If only 20% of their health remains, they return to their original spot to bury and heal, and when their health reaches 50%, they come out again, if there are any prey in range. While they're regenerating, their health wheel will be constantly visible above the ground. "Although they are among the weakest of enemies that can cause any harm, Male Sheargrubs with attack and devour your Pikmin if you don't instruct your troops to fight back. When your army is suprised by the surfacing creatures, use the C Stick to swarm them." "These burrowing creatures spend most of their time underground, showing themselves only when a potential meal wanders by. When Male Sheargrubs emerge from the ground, they use their pincers to tear through their unfortunate prey. When you encounter a group of Male Sheargrubs, retreat to a safe distance and throw one Pikmin directly onto each enemy. During prolonged battles, Male Sheargrubs will shake their attackers by burrowing underground. Don't let your guard down until you're sure the area is clear of enemies." The species is relatively weak compared to most other creatures, but if one happens to get a hold of a Pikmin, it is invincible to swarming until the Pikmin dies. If a single Pikmin is thrown onto the Sheargrub's back, it will die instantly, and the Pikmin will be saved. Attack with Olimar if possible, but be careful, as a bite deals massive damage. If there is water nearby, like in The Forest of Hope, lead them into it. Since they cannot fly, and will keep following their prey, they will eventually drown. The male Sheargrub's mysterious invincibility is no longer present here, making them incredibly easy to kill. Simply swarm with a group of Pikmin and they'll have no chance. Same as in Pikmin, if there is a body of water nearby, lead them in and drown them. Male Sheargrubs are much more rare in this installment, but can be a slight nuisance nonetheless. The invincibility is once again no longer present, so just use a good amount of Pikmin to take care of them. In this game, they are resistant to water. These enemies are also not known to be able to eat bridges like in previous installments. Like the Female Sheargrub, this creature is called "Male" Sheargrub due to it being the male counterpart. Its Japanese name, ウジンコ♂?, can be translated to "Parrot Maggot ♂", and contains the Mars symbol to identify it as male. The Male Sheargrub's scientific name, Himeagea mandibulosa, is the same as the female's. In Pikmin, its internal name is kabekuiB, in which B serves to disambiguate between the other members of the mandiblard family, with the Female Sheargrub using the letter A, and the Shearwig using C. The internal name in Pikmin 2 is simply ujib. uji is part of its Japanese name, and b is once again an identifier. Like Pikmin 2, Pikmin 3 calls it ujinko_b, where b is the identifier. 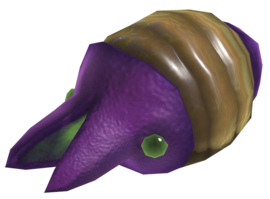 In the GameCube Interactive Multi-Game Demo Disc Version 18, this enemy is referred to as "Shear Grub (Male)", with a space. A closeup of a few Male Sheargrubs from the Piklopedia. Male and Female Sheargrubs on the enemy reel. Close-up picture of a Male Sheargrub in Pikmin 3. The creature's e-card, #45 (11th yellow card). An alternative, fatter version of the Male Sheargrub exists unused inside Pikmin 3.